Blossom was my pick for 2008. 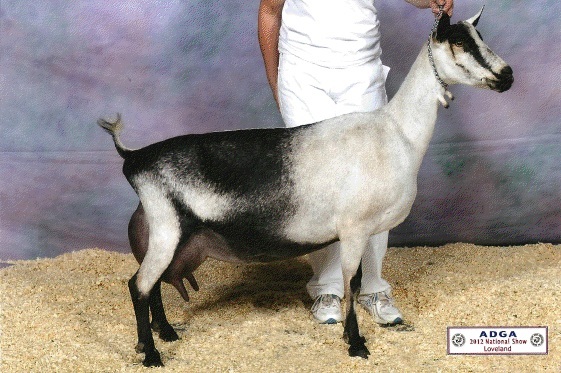 She has two National Champions and a lot of milk in her pedigree. She is extremely level on the top line and has a beautiful level rump. She has her daddy's waddles, which gave her her name. She takes on her dam's dairy character, with a lean long neck and long flat open ribs. She's deep in the body with good width throughout. I'd like to see a flatter shoulder blade. She has a high escutcheon and plenty of width between the hocks. She tracks straight and has great straight front legs when viewed from the side. Her udder has strong attachments and support. The rear is high and very wide and the fore is smoothly blended. I wish she had the fore udder extension of her dam. Her teats are ideal in shape and size. She is a joy to milk. Blossom had a short lactation in 2011. She kidded late and then bred early. 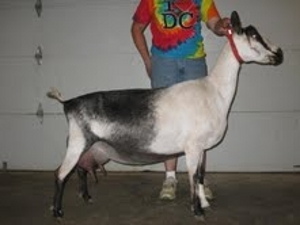 Due to the 2012 drought, we have chosen to not breed Blossom for 2013. She will be kidding in 2014.